Basil season is upon us, so what better time to enjoy the Indochine? I am not referring to this atrocious glass of candy from Sandra Lee, but rather to this elegant concoction from Mayahuel in Manhattan, courtesy of CVS. I don’t have a lot to say about this one, except you should make it. It’s a little lower-volume than I am used to, but the combination of Zacapa 23, Green Chartreuse, and fresh basil is just too good to miss. Green Charteuse is spicy and herbal on its own, but it contains the extracted flavors of its herbs. When a flavor is extracted into alcohol it becomes abstracted — it retains its aroma but not the fullness of its flavor. By adding fresh herbs, we build a flavor which tastes much more complete, like a song that ends on the right note. All of the flavors in this drink have a certain earthy quality — oak wood, leaves, sugar cane, spices. It would be perfect to sip on your patio, or even out in a forest. Zacapa 23 is a little bit expensive to be using it as the base spirit in a lot of mixed drinks, but every time I have made a drink with it I have been very impressed. When I use it in a rum drink, I almost feel like I’m cheating. It’s that great. 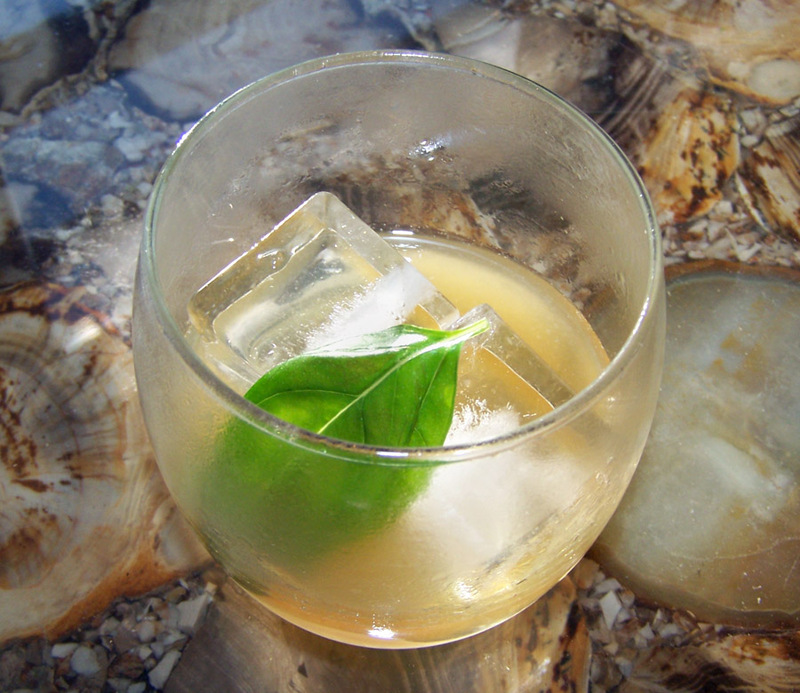 Muddle the basil leaves in the simple syrup, then shake all ingredients over ice and strain over fresh ice. Garnish with candied ginger, or, if you don’t have any of that, a fresh basil leaf. This drink was a little small, so if you doubled the proportions, I would certainly empathize. It looks insubstantial in my double old-fashioned glass, but I don’t have a smaller rocks glass, something I shall have to rectify soon. The original recipe called for candied ginger, which would have been a nice aroma to accompany the drink, but I really enjoyed the additional scent of basil as I took a drink. Basil has a delicate flavor, so the extra aroma from the garnish really helps it shine. You should make this, it is excellent. Categories: modern drinks | Tags: basil, booze, chatreuse, cocktail, cocktails, drinking, drinks, green chartreuse, lime juice, mixed drinks, mixology, muddle, rum, thai basil, zacapa, zacapa 23 | Permalink. The recipes for the Diageo Happy Hour at Tales were all scaled down to fit in their small glasses (although often times the drinks were batched and poured out 4 or so at a time) which was good since getting a taste of as many of the drinks as possible was sort of the idea. Doubling the recipe would put it into normal size. As for Zacapa, yes it’s expensive and yes it’s good. I have no clue what Eryn designed the drink with, but Zacapa is distributed by Diageo so they adapt all the recipes to fit their portfolio. A dark rich rum like Diplomatico would work about as well for half to 2/3s the price depending on which one you bought. Ah, that explains it. Often in my experimental mixing sessions I will pour a drink into three tasting glasses. issue. I like a tad more information.